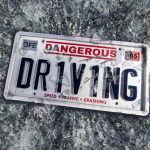 Dangerous Driving is a brand new racing game from the small indie team over at Three Fields Entertainment. If you haven’t heard of them they were founded a few years ago by Alex Ward and Fiona Sperry, the same two people who founded Criterion Games many years ago. 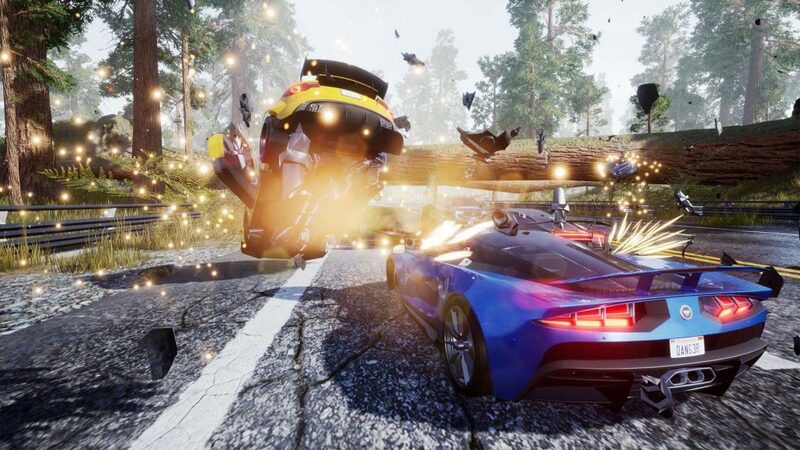 Fans of the Burnout franchise have been asking for years for a new entry in the franchise so Three Fields took it upon themselves to build a few games that are similar to that legendary racing franchise. 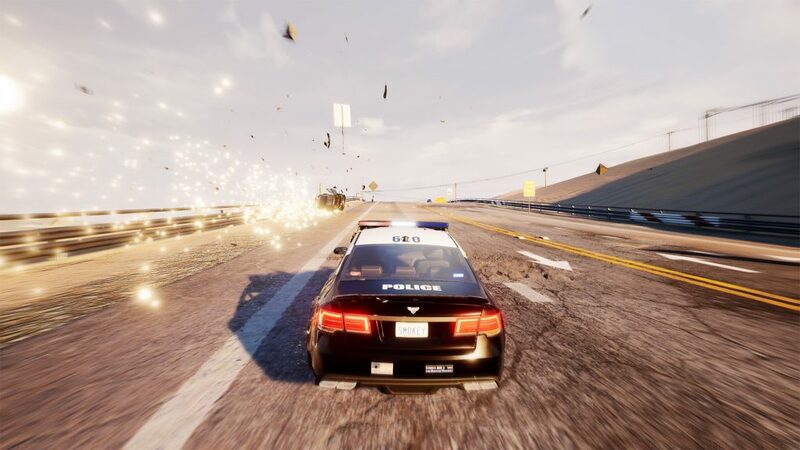 You might’ve already played Danger Zone 1 & 2 (you can read our review of that one here) that they made over the past few years which were basically games built like Burnout’s crash mode. 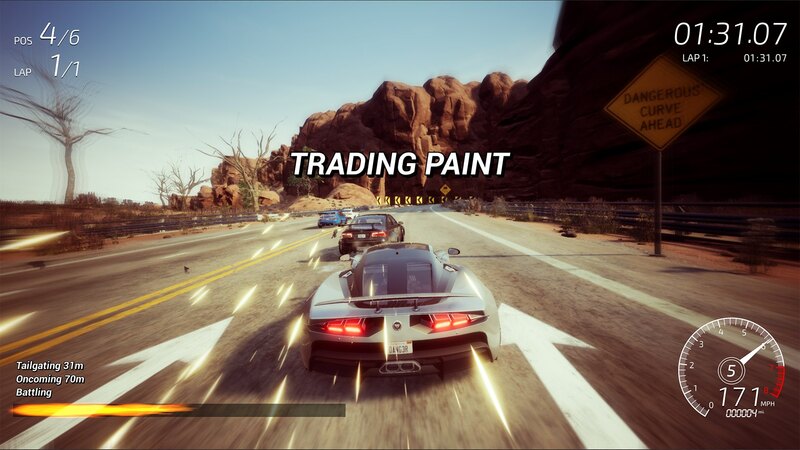 Now with Dangerous Driving they have built an arcade racing game meant to be a spiritual successor to Burnout. Unfortunately, while it hits the right gears on some things it misfires on many others. 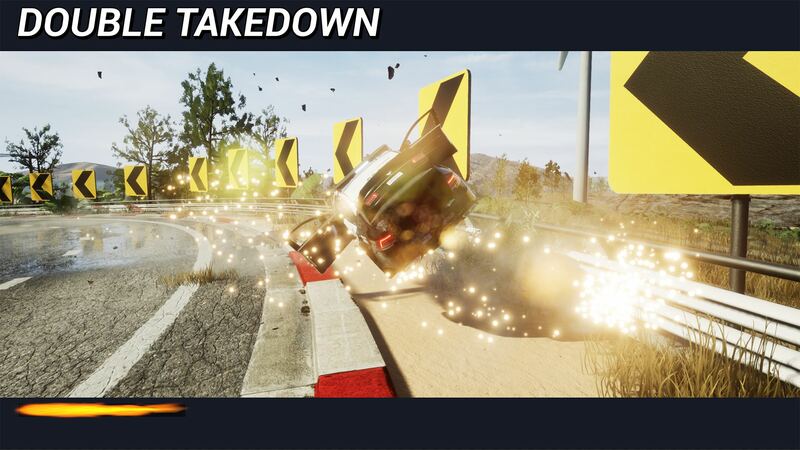 Dangerous Driving will immediately be familiar to anyone who played the Burnout games on the PlayStation 2 or Xbox. It both looks (for better or worse) and feels like those games from back then. The game has a campaign mode consisting of over 60 different events in total. While this may seem like a lot it really doesn’t take that long to go through them all. You’ll unlock new events as you progress as well as car classes which you are also limited to at first. The game has SUVs, sedans, coupes, supercars, hypercars, and formula one cars with a total of 27 vehicles in all. Regardless of what kind of event you are in the usual goal is to drive really fast to the finish line and crash into opponents to take them out along the way. The different events include basic multi-lap races, Face Off which has you racing against a single opponent, Survival that has you going as far as you can without crashing, Heatwave that has you trying to chain boosts, Pursuit which has you playing as a cop and trying to take out other racers and a few others. One of my issues with the game though is just how it feels to play. No matter what car I drove they all kind of felt the same and they really didn’t have any weight to them at all. One thing I like to have in a racing game is different view options so that I can see what is coming up on the track. Dangerous Driving though only has two options and both have issues. You can either have a first-person view from the front of the car or you get a behind the car view. I usually use the behind the car view in other racing games but the problem with it in this game is that it is too low which prevented me from seeing what was ahead on the track clearly. This led to me many times not knowing until too late which way the road was turning or if a vehicle was in my path which then led to me crashing more than I should have. Which brings me to my next problem with the game and that is the crashes themselves. The collisions and crashes in this game simply lack a wow factor or really any satisfying factor at all. The damage model on all of the vehicles is extremely poor and the only thing that really falls apart is the wheels or doors. Another issue is that anytime you wreck someone the game cuts to them being wrecked while also still progressing in the background. This means that when it cuts back to the gameplay you are in a different spot further down the track then what you were. The transitions between the wrecks and going back to the gameplay aren’t really smooth either, instead it just kind of jumps back in. This goes for when you wreck as well with the game then cutting to a black screen to reset you back on the track. Something that is kind of cool about Dangerous Driving is the persistent wrecks that Three Field included. This means that wrecked cars remain on the track which also means more hazards for you to be aware of when you circle back around on your next lap. Another problem with this game is that it has horrible rubberbanding AI in it. Anytime I was in the lead and would crash I would immediately be passed by four or five of the other racers no matter how far in the race I was. If I crashed them though they sure caught right back up to me in a hurry. It seems you can never really build a big lead on the AI which means if you crash in the final lap or near the end chances are you won’t be finishing in any of the top spots. It just isn’t fun to never be able to feel like you can win a race for sure because one tiny mess up is going to have you starting the event over to get a gold medal. I also noticed that the AI only seems to use their boost when you use yours. If you don’t use your boost neither will they. I’m not sure if this is a bug or what but it’s yet another odd thing about this game. All of this isn’t to say that the gameplay isn’t fun at all because it absolutely can be. When you are boosting and going hundreds of mph down the road, drifting around corners and narrowly dodging oncoming traffic it feels great. The game absolutely nails the feeling of speed which is important for games like this. It’s just that the cheap AI, bad camera, and the weightless feel to the cars detracts from the experience. In terms of performance though the game runs at 60fps on the PS4 Pro that I reviewed it on which is great for a game like this. However if you don’t own the upgraded consoles be aware that it only runs at 30fps on the standard PS4 and Xbox One and apparently has some stutter issues there as well. In terms of graphics the game looks decent considering this is from a small team with a limited budget. None of the environments in the tracks wowed me but they weren’t horrible. I already mentioned that the damage models aren’t good but the general car models aren’t great either. In fact they almost look like cars you would see on a mobile game. I know Three Fields is a small team but this is still a $30 product and I kind of expected the cars to at least look a bit better than they do. Their was a odd design choice made when it came to the audio in the game as well. 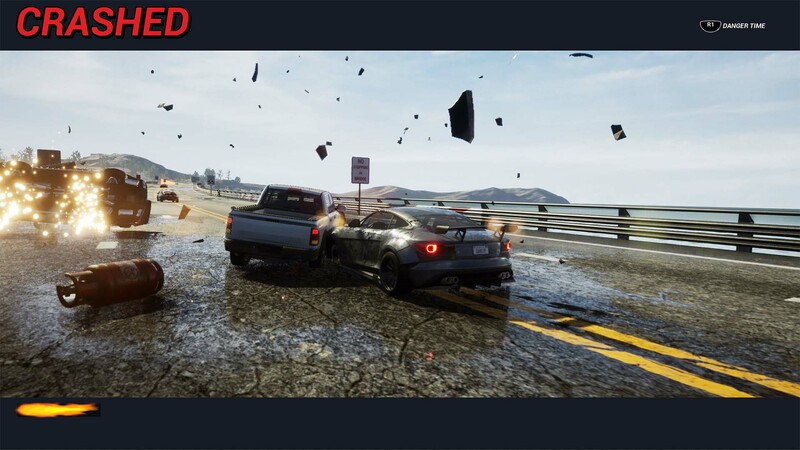 The Burnout games were loved as well for their soundtracks back in the day but Dangerous Driving has no music at all outside of a track that plays in the menus. This is because Three Fields decided to partner with Spotify and let Spotify Premium members sign in through an option in the menu to play their own music. That’s great for some people but I don’t subscribe to Spotify so I had to play the whole game without any music at all. I know many players like to play their own music in games like this but not everyone does and those other people usually enjoy having a soundtrack in the game. If you are going to make a spiritual successor to Burnout then you are going to be expected to have many of the same features that that franchise had and Dangerous Driving just simply doesn’t have the music feature. 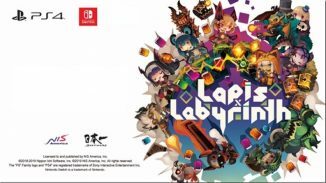 The last thing I want to mention is that if you were hoping to have some fun in this game with your friends you can’t do that either, at least just yet. The game has no multiplayer options at launch currently. 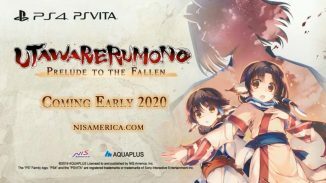 Three Fields did say that they will be releasing an update sometime in the first month after launch hopefully but we’ll have to wait and see if it makes it that soon. People may have moved on from it by the time that rolls around and I just kind of feel like maybe this game should’ve been held off until that was ready. That would’ve given them some more time to work on the other issues in the game as well. If you are interested in the trophies/achievements there are 40 of them and they will have you trying to gold medal every event, driving hundreds of miles in every vehicle and so on. Dangerous Driving isn’t the Burnout game that many of us have been waiting for sadly. 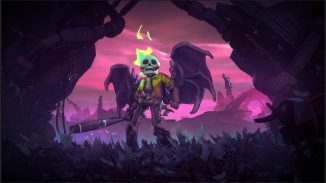 There are glimmers of that here but they are bogged down by other issues like rubberbanding AI, poor crashes, and the lack of an in-game soundtrack. I did have fun for awhile with it but the issues started to be too much for me to call this a good game. Hopefully some improvements can be made to it over time at least. 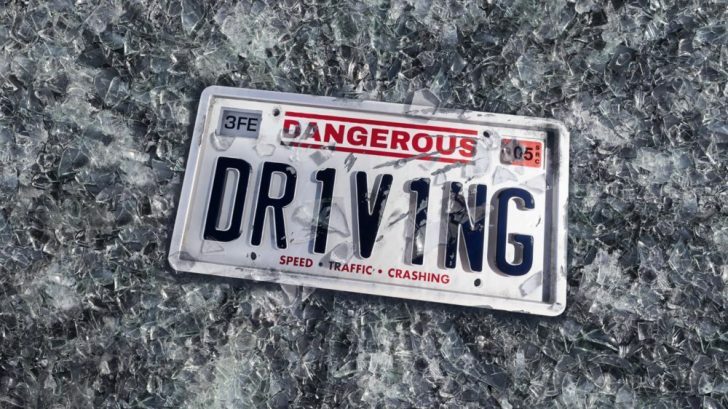 *Dangerous Driving is out now on PlayStation 4, Xbox One, and PC. Reviewed on a PS4 Pro. Review copy provided by the publisher for this review.